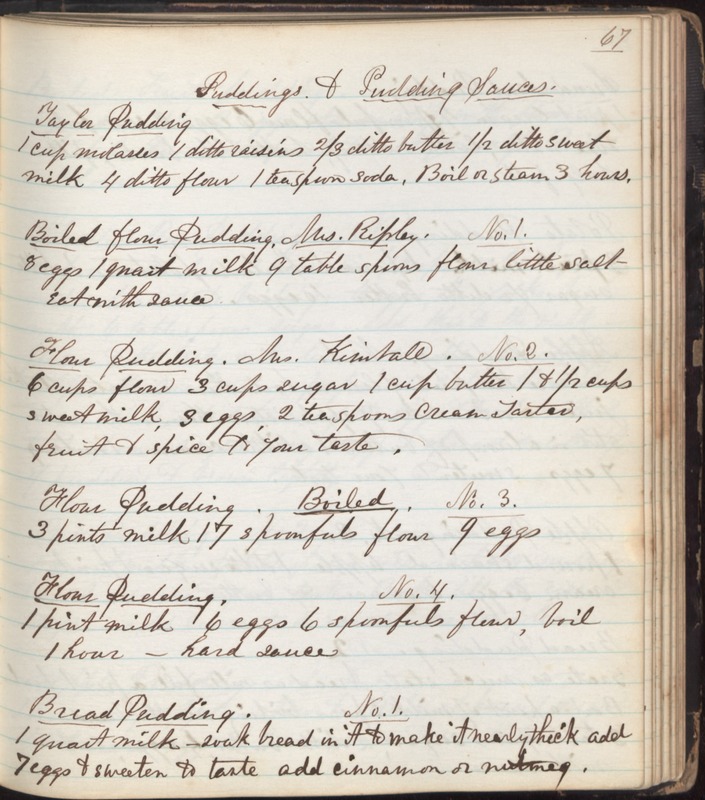 Puddings & Pudding Sauces Taylor Pudding 1 cup molasses 1 ditto raisins 2/3 ditto butter 1/2 ditto sweet milk 4 ditto flour 1 teaspoon soda. Boil or steam 3 hours. Boiled flour Pudding, Mrs. Ripley. No. 1. 8 eggs 1 quart milk 9 table spoons flour little salt eat with sauce Flour Pudding. Mrs. Kimball. No. 2. 6 cups flour 3 cups sugar 1 cup butter 1 & 1/2 cups sweet milk, 3 eggs, 2 teaspoons cream tartar, fruit & spice to your taste. Flour Pudding. Boiled. No. 3. 3 pints milk 17 spoonfuls flour 9 eggs Flour Pudding. No. 4. 1 pint milk 6 eggs 6 spoonfuls flour, boil 1 hour - hard sauce Bread Pudding. No. 1. 1 quart milk - soak bread in it to make it nearly thick add 7 eggs & sweeten to taste add cinnamon or nutmeg.